Wire fencing provides a relatively maintenance free and cost effective means for fencing large areas. In the event you are fencing a pasture, use approved wire rolls with small openings (2 x 4 inch) to keep your horse from getting its hooves stuck. The wire rolls go up quickly and never need painting. Finishing off the fence with a top board provides extra visibility (to the horses) and a clean look. It also allows for extra height and avoids damage from falling tree branches and "city folk" who are too lazy to walk to the corner. 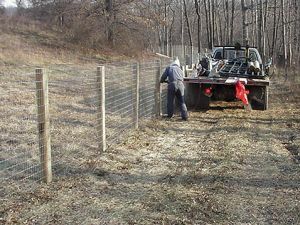 Other articles discuss the types of fencing, installing fence posts and board fencing.